A group of narc'd divers (at least I was). Dive Journal: There’s a really deep dive scheduled this morning. Due to the depth and an uneasy stomach, John elects to sit this one out. “Whip Wire Wall” is named after beautiful areas of dark green wire corals that extend out from the nearly vertical wall. To get to them, however, we must descend to 140 feet! 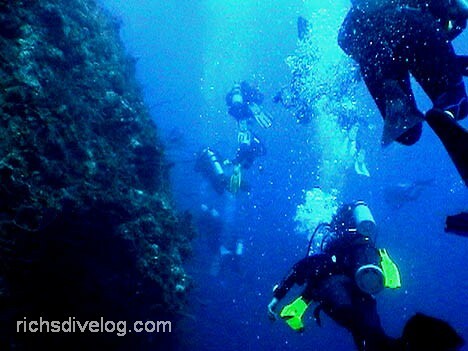 Of course, at that depth, it is a quick profile, and I can tell the divemasters are especially attentive. All three of us set personal depth records here, and Janel and I get our expected dose of narcosis. Linda doesn’t seem to be affected by it. I come across a fish later identified as a blackcap bassslet, another new fish for me. Nearing the end of the dive, I catch some decent video of a polarized school of Creole wrasses, who part as a bar jack zooms through. During our safety stop, I start videoing a big weird looking jellyfish before Moose shoos me away from it.